Quality and safety for our consumers is top priority. 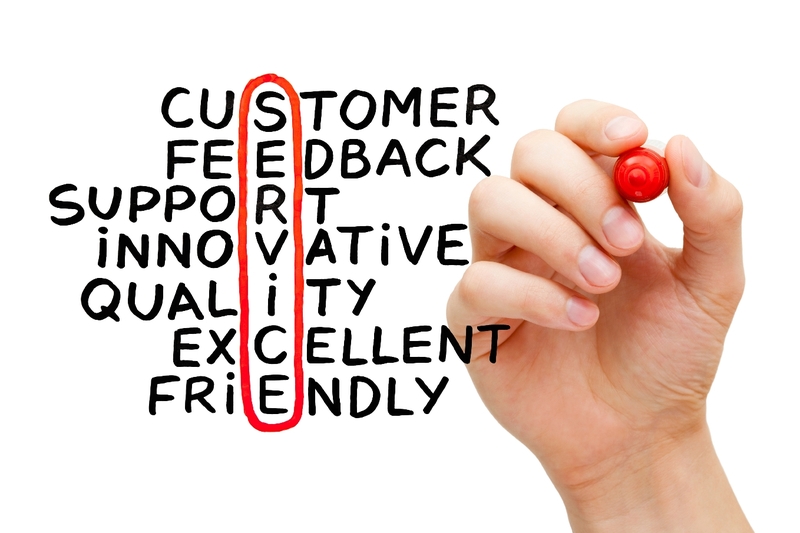 This applies to entire portfolio of all our systems and services. “Visakha dairy endeavors to be one of the largest processors of milk and manufacturers of milk products in India. We are committed to provide hygienic, safe, nutritious milk and milk products while meeting statutory, legal and regulatory requirements to achieve customer satisfaction and in turn to improve economy of our member producers. To this effect the management is committed to communicate, implement and maintain and continually improve the Food Safety Management Systems in the Dairy”. The basis of our milk and milk products contains essential nutrients such as proteins, fats, milk sugars, vitamins and minerals, which help to create healthy and delicious dairy products, which are sustainably produced. We take utmost care to ensure safe production to manufacture high quality products. We have a single approach to guarantee the safety and quality of the entire chain, from collection of milk right through to distribution. We call it is a focus of the system. Inspection, monitoring and auditing are essential within food safety and quality and our approach to food safety covers the entire supply chain, starting with farmers and suppliers. We follow rigorous procurement and auditing processes to ensure we select safe, high quality raw materials. This includes defining specifications for the materials we use, and performing checks to ensure they always comply with the most stringent regulations and the latest scientific knowledge. If they do not comply we reject them. The product which leaves from the factory shall pass 18 tests (chemical and microbiology) to confirm the food is safe to consume. The testing procedures verify the product compliance with internal and external standards, including for harmful compounds or microorganisms in the materials we use. We have so many stringent, inbuilt controls to guarantee safety. Packaging plays vital role in ensuring the product reach consumers in a safe condition. It also carries clear information about how to store ad use the product, with information regarding ingredients and nutritional aspects of the products. We make sure that best-before and use-by dates are correct so consumers understand when the product will be past its best and when it will no longer be safe to consume. We use unique batch codes, to tell us exactly when a product was manufactured, what ingredients went into it and where those ingredients came from. 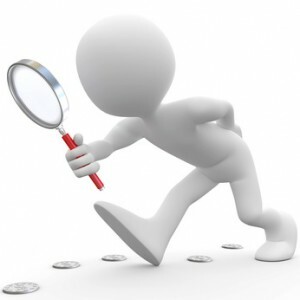 We ensure effective traceability of our process by maintaining batch codes. 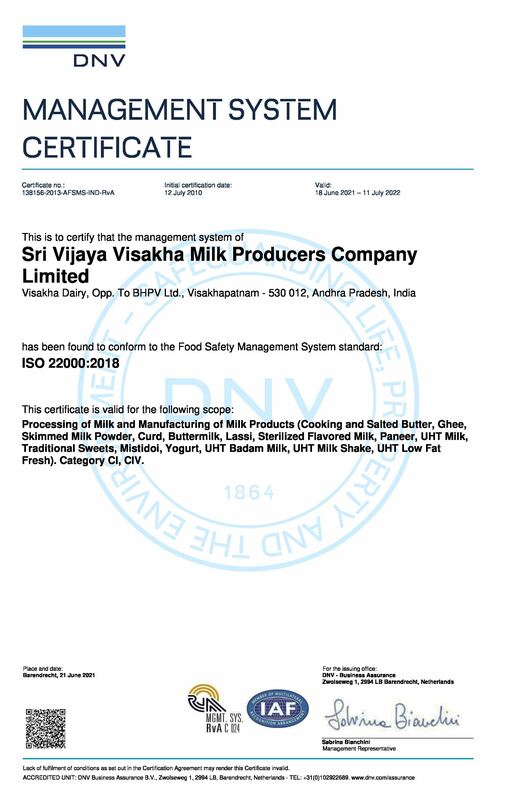 Visakha Dairy’s “Food Safety Management System” is the platform that we use to guarantee food safety compliance with quality standards and to create value for consumers. Our internal Quality Management System is audited and verified by independent certification bodies to prove conformity to internal standards, ISO norms, statutory and regulatory requirements. We apply Good Manufacturing Practices (GMP) recognized by FSSAI (Food Safety Standards Authority of India) to ensure quality and food safety. 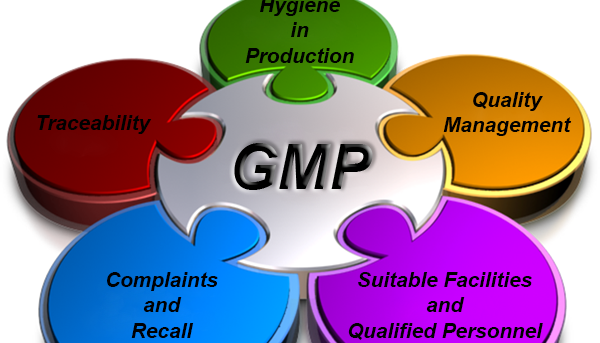 GMP covers all aspects of manufacturing, including standard operating procedures, people management and training, equipment maintenance and handling of materials. We apply internationally recognized HACCP system to ensure food safety. This preventive and science based system identifies, evaluates, and controls hazards that are significant for food safety. It covers the entire production process from raw materials to distribution and consumption. 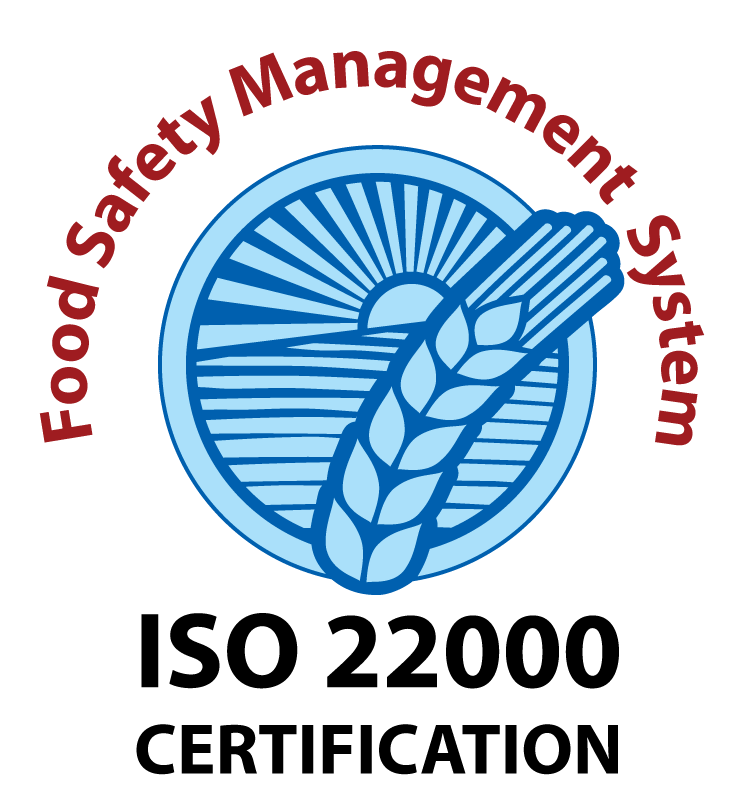 Our Food Safety Management System, HACCP plans are verified by external certification bodies against the international ISO 22000:2005 standards. Visakha Dairy is maintaining separate consumer cell, where teams of quality control and marketing departments will actively participate and ensures that there is immediate respond on consumer enquiry, question or grievance. The labels of Visakha dairy provides address and telephone number, where consumers are invited to talk.